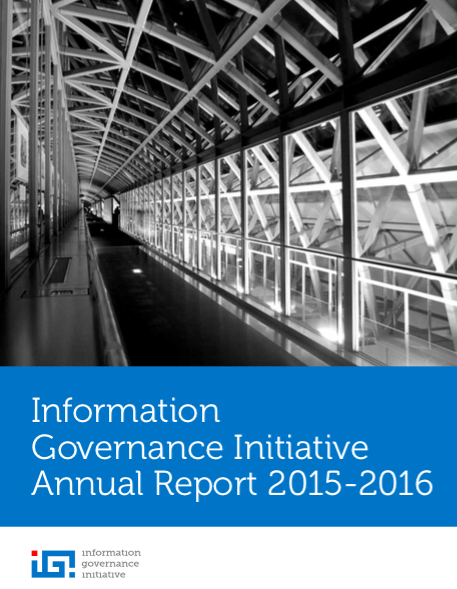 We are proud to publish the Information Governance Initiative 2015-2016 Annual Report. This is the second year the IGI has published the industry’s most comprehensive research on information governance (IG) as a concept, profession, and market. In the Report, based on extensive surveying of IG practitioners and providers, we look at what projects organizations are doing, what they are spending, and whether quantifying the economic impact of IG is important to organizations and, if so, how they are calculating it. We look at barriers and drivers to IG. We explore IG leadership structures and the emerging role of the Chief Information Governance Officer (CIGO) which is starting to gain traction. And much more. The Report is loaded with infographics that IG practitioners can use freely. These are available in a separate presentation available for use under a Creative Commons license and can be found in the Resources section of the IGI Community.